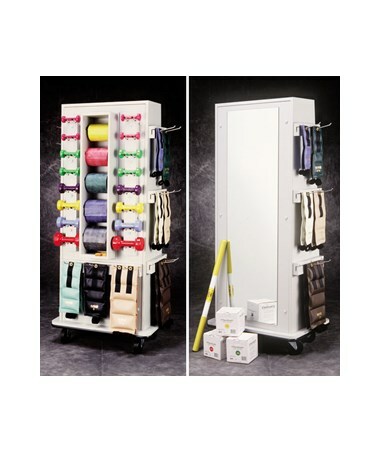 The Clinton Industries Blake Slim Weight Rack with Mirror is a medical storage equipment designed to store or hold up 48 cuff weights, 16 dumbbells and 5 rolls of an exercise band. Awesome and Compact Design. 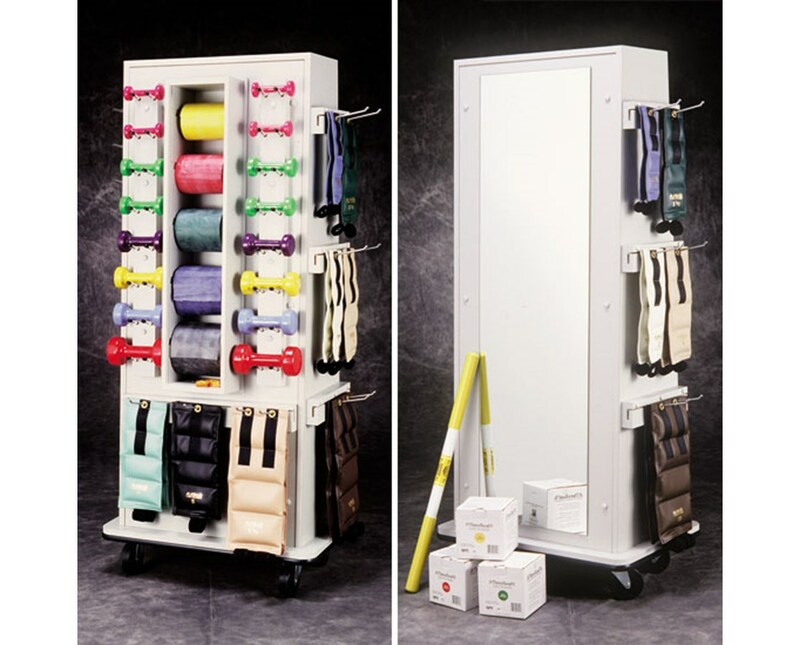 With 5 independent and quick-change positions, the Blake Slim Weight Rack with Mirror is designed to hold the user's choice of exercise bands of 50 yds with hollow core center only and/or tubing. The Weight Rack is made to use all 4 sides for greater storage capacity and because of its sleek form factor, it makes it a great choice for any physical therapy or rehab facility that requires minimum floor space requirement. Sturdy and Secure. The Blake SlimRac features a mirror with polished edges and an American National Standards Institute (ANSI) 297 Standards safety backing. Its dumbbell rods are constructed with strong polycarbonate and is angled for added stability. With a protective bumper molding around its base to fight-off against scuffs and damages, the SlimRac features 4" swivel casters, with 2 that lock, for easy and smooth transport throughout the facility. The Clinton Industries Blake Slim Weight Rack with Mirror comes with a size of 28" L x 22" W x 65.5" H.